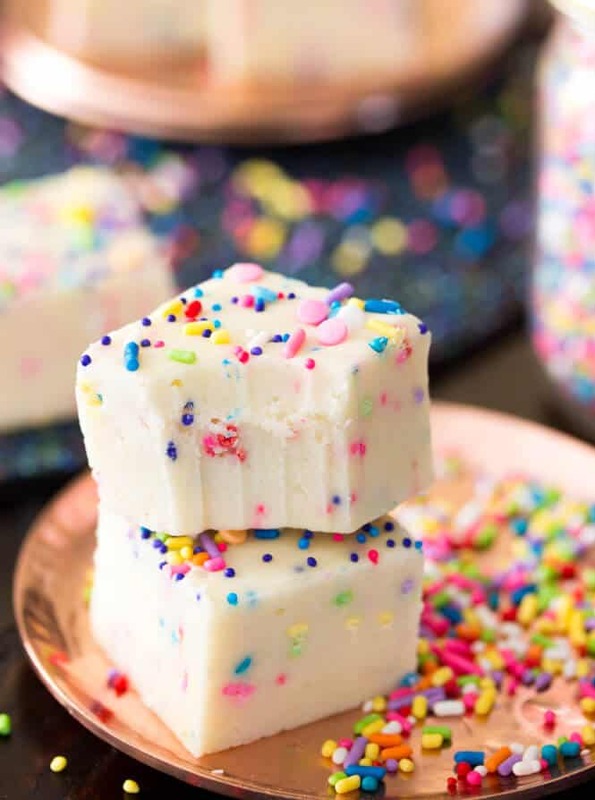 A sweet funfetti cake batter fudge that’s made with cake mix and packed full of colorful sprinkles. A great birthday cake alternative! Welcome to another installment of a day in the life of a sprinkles addict. I may be biased, but it’s not a bad addiction to have, though it is causing some tension in my marriage — Zach does not like sprinkles in his desserts, or at least not nearly as many as I do, and I may or may not be storing (literally) 30 pounds of sprinkles in our office. It’s also making its way into my work life (I shook a sprinkle out of my scrub top in the hospital the other day — Idon’tevenknow), and I had to brush bright pink powder out of the crevice of my camera where I accidentally crushed a lone sprinkle. 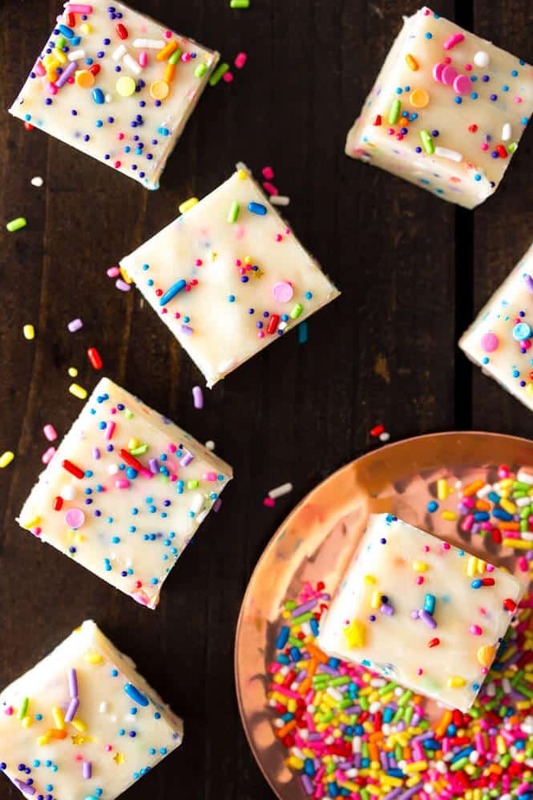 I’ve presented to you plenty of sprinkle-stuffed desserts in the past — funfetti cookies, colorfully sprinkled cheesecake, and even a recipe for DIY sprinkles, to name just a few, but I think this is the first time that I’ve worked sprinkles into fudge. Today I have a simple, decadent, no candy thermometer required, cake batter fudge for you. I do use box-mix cake batter here (I’ve waffled in the past on my preference for making things solely from scratch and incorporating box-mix for the most authentic flavor), but for this recipe cake mix resulted in the easiest and best tasting fudge of all of my taste-trials. I love making condensed milk fudge recipes because of their simplicity — it’s just a matter of combining the ingredients on the stovetop and melting them together for sweet confection perfection. 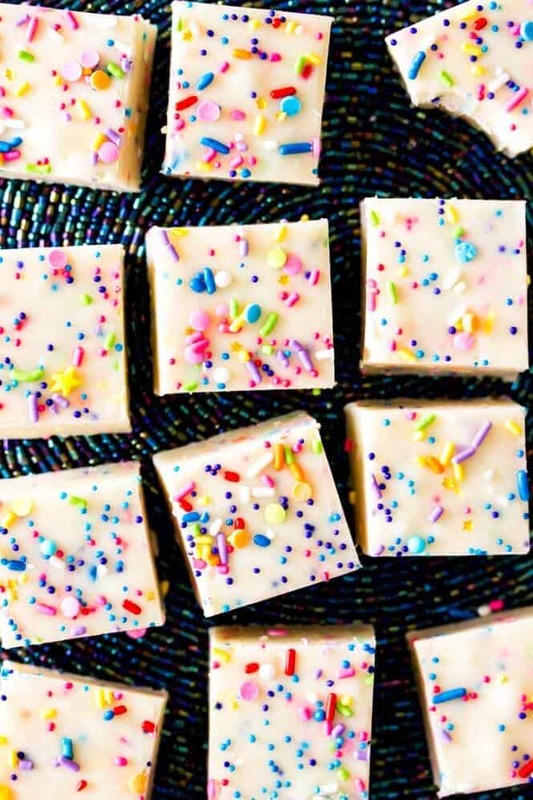 This funfetti-packed cake batter fudge is very creamy, very sweet (cut it into small pieces! ), and a little more than irresistible. While I mentioned that Zach doesn’t like biting into sprinkles, I love the subtle texture that they make — it keeps things… interesting, fun, and (very) colorful. 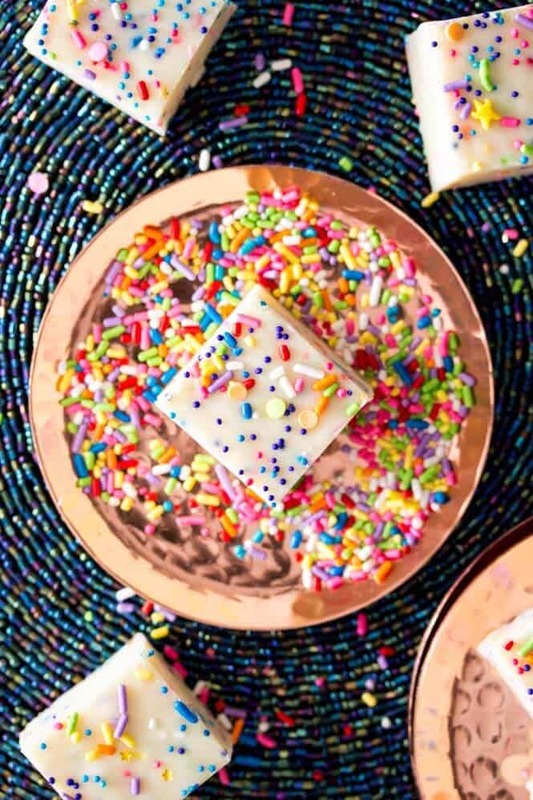 You can use regular sprinkles or nonpareils, or a mix of both (which is what I did here). The nonpareils give a little more of a crunch (I don’t want to say “gritty” because that sounds bad and it’s really a lovely texture, but I think that will give you a good idea of the taste), while the sprinkles are softer and less obvious. Alright, well I’m off to sweep up some sprinkles and catch up on the lovely comments and e-mails that so many of you have sent in the past crazy-busy week (keep them coming!). 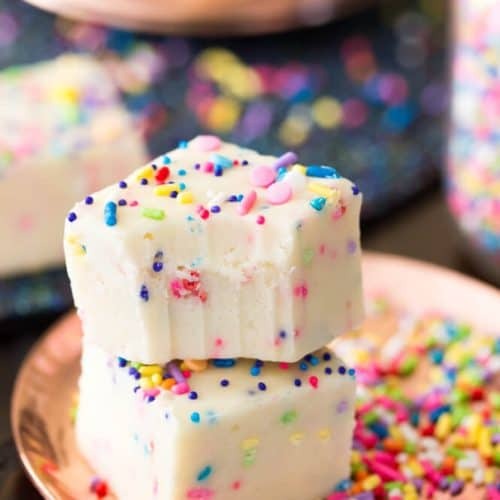 Sweet cake batter fudge studded with sprinkles! Line an 8x8 pan with aluminum foil and lightly grease or butter the foil. Set aside. Combine condensed milk, chocolate chips, and butter in a medium-sized saucepan over medium heat. Stir frequently until butter and chocolate chips are completely melted and mixture is well-combined. Reduce heat to low, and add cake mix and vanilla extract. Stir well, until cake mix is completely absorbed. Remove from heat and stir in 2 Tablespoons sprinkles/nonpareils. Immediately pour into prepared pan, use a spatula to gently smooth the surface. Sprinkle with additional sprinkles, if desired. Allow to cool completely, until firm (this will take several hours at room temperature, or you can speed up the process and refrigerate 1-2 hours) before cutting and serving. I’ve noticed alot of people are having problems getting this recipe to set. I made it for the first time today and I heated the mixture on medium while whisking with a hand mixer until it was quite hot, not boiling and it set perfectly. I’m so happy to hear it turned out for you, Frankie! Thank you for commenting! I had trouble with it setting, too. It was really only the bottom of it that I had issues with. It was sticky. I think the problem was the butter I lined the pan with. After I carefully scrapped the fudge out and turned it over, the bottom hardened appropriately once I left it in the fridge for about half an hour. Next time (today), I’m going to try to use wax paper instead of buttering the pan. Hi Joyce, I’m really not sure, did you let it set long enough? I made this last night and even though mine also didn’t set up, I’m not understanding the frustration. I just got a spoon, scraped up about tablespoon& sized balls rolled them in powdered sugar. Viola, Dale batter truffles! I love anything cake batter, so the flavor and texture are a win for me. Learn to play with ideas in the kitchen, y’all. What kind of chocolate chips did you use? brand? I’m wondering if that’s the issue. And you did you sweetened condensed milk and not evaporated milk, correct? I literally cannot replicate this problem in my own kitchen so any details you can share might help me help someone else in the future. I made this recipe and re-read the instructions 4 times. I did everyteverything as directed and it wont set. Now that I’ve read other comments I wouldn’t have made this. To the author please consider revising the recipe or updating in some way. Thank you. Hi Malorie, I’m really sorry to hear that it didn’t turn out for you. I’ve tested, re-tested, and re-re-tested and it has always come out just fine for me, I’m really not sure why it doesn’t set for everyone. 🤷🏼‍♀️You did use one can of sweetened condensed milk and not evaporated, right? Just want to make sure as I know some people have used evaporated milk instead. I tested this out this morning. Unfortunately mine wouldn’t set either. I made the whole recipe. I was hoping to make this treat for my daughter’s birthday party. It is an adorable looking dessert! Hey! So I tried this out with exactly half of each ingredient, and it won’t set (even in the freezer). It is a little softer and sticker than Play-Doh, if that helps. What could I try different next time? More sweetened condensed milk? More chips? I did use the microwave to heat, but figure that shouldn’t be an issue? I would try adding more chocolate chips and seeing if that helps. I made this according to the recipe but it was like putty. After overnight in the fridge and 4 hours in the freezer. So added 2 more cups of chocolate to a pan and the. Added in the putty fudge and re set it. It came out perfect after this.